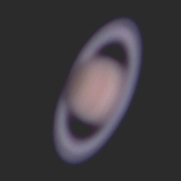 Simon Allcock captured the following image of Saturn on the 20th December 2004 using a Meade LPI attached to his Meade LX-90 8" Schmidt-Cassegrain. The image was processed using Photoshop. 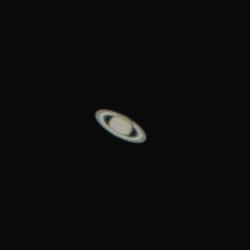 The following image of Saturn was captured by Adrian Brown through his Celestron Nexstar 5 using an ATIK Instruments ATK-1C camera and a 2x Barlow lens on 17th March 2004 at 20:53 UT. The camera is a modified Phillips Toucam designed to take long exposure photography. The shadow of the planet on the rings is striking. 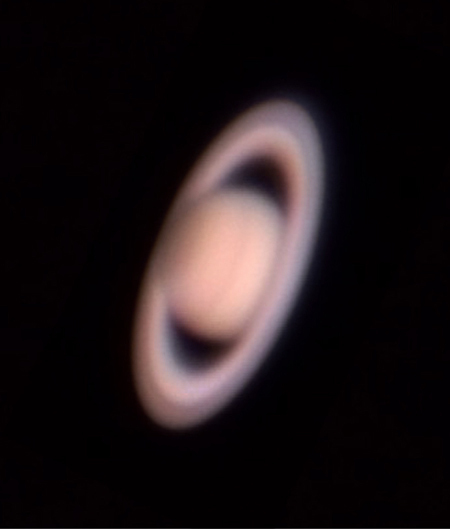 This remarkable image of Saturn is composed of a stacked set of 60 frames of video shot by Graham Ensor through the Society's 10-inch Newtonian reflector at the Flamsteed Observatory on the night of 16th-17th January 2004. Mike Dumelow provided a specially constructed eyepiece which fitted between the telescope and Graham's Panasonic DV camcorder. 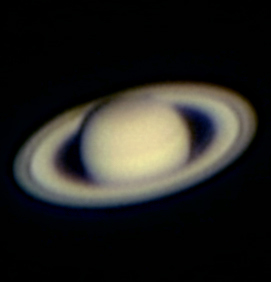 The image was stacked by Graham using Registax software and further processed in Photoshop to bring out detail. The rings are wide open and the Cassini Division is quite evident between the outer A ring and the inner B ring. Note that the B ring appears brighter than the A ring and that the B ring appears to darken noticeably on its inner edge. The shadow of the rings can be seen on the planet where they lie in front of the disk and the shadow of the planet can also be seen on the rings where they pass behind Saturn. A dark band and 'cap' are visble on Saturn itself. 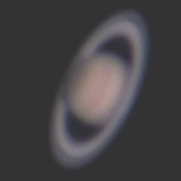 The following two images of Saturn were taken by Adrian Brown through his 5-inch Celestron Nexstar on the evening of 17th January 2004 using a £50 webcam and free software to do the image stacking.